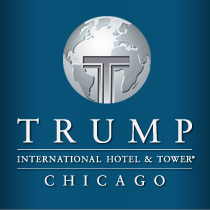 The Terrace at Trump, a 16th floor outdoor oasis, has become one of the city's most sought-after destinations since opening in 2009 and showcases a dramatic vista of the Chicago skyline as well a picturesque view of Lake Michigan, along with the Chicago River and its famous bridges. Upon arrival, guests are escorted to The Terrace at Trump via the Bridges Room, one of the hotel's intimate dining spaces. Upon setting foot outdoors, they encounter a luxurious, serene atmosphere, accented by a contemporary décor that includes beautifully placed up-lighting, water elements, lush foliage, torches, and touches of bamboo weaved into the custom-designed furniture throughout the outdoor area. Comfortable lounge, booth, and table seating – designed by Alex Morales of Smartmouth Designs – creates an intimate environment to accommodate a range of party sizes. Guests also enjoy lounge music that fuses South Pacific beats with notes of Latin and American jazz, as well as live DJ performances taking place up to twice per week. With the Chicago River in their direct sightline, guests will also appreciate a first-hand view of Chicago's summer fireworks displays from Navy Pier, taking place every Wednesday and Saturday evening from Memorial Day through Labor Day. The Terrace's cocktails are created with freshly squeezed tropical fruit juices, housemade syrups, international rums, and a variety of craft spirits – all ideal for Chicago's hot summer months. The Terrace at Trump also features an extensive selection of wine, beer and spirits.